One of the military-industrial-entertainment complex’s most talented warriors has been targeted for termination. 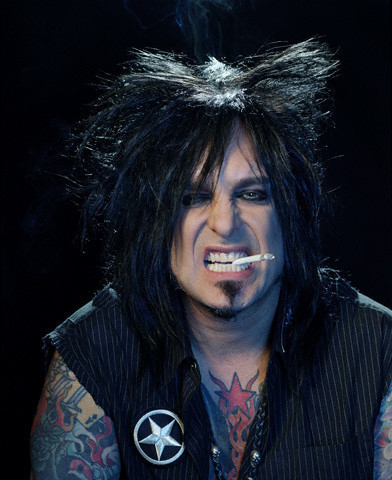 The lovable, alcohol and cocaine fueled robot-musician known as Nikki Sixx was created in 1981 by the Pentagon in order to help distract teenagers from engaging in issues that actually effect their lives and keep them focused on the fantastic illusion of limitless excess. While many Sixx-like androids have surpassed its work, Nikki’s place in the history of American disempowerment will not be soon forgotten. Sixx was the sixth in a series of metal-o-bots, cyborgs created by the government to pacify a generation of young people who had begun to question the absurdity of America’s institutions and customs. The original prototype, Nikki Onee, was created in the 1960s. Its purpose was to play rock and roll then teargas anyone who danced to it. It was tested in a high school in Arkansas but was determined to be “too square to be effective”. Other failed Nikkis included the progressive rock playing, Operation MK-Ultra inspired Nikki Threee. It attempted to use odd time changes, unique instrumentation and lysergic acid fumes in order to stupefy young people into obedience. Unfortunately, it was discontinued after a malfunction caused The Great 1973 King Crimson Acid Freakout in Pocatello, Idaho. 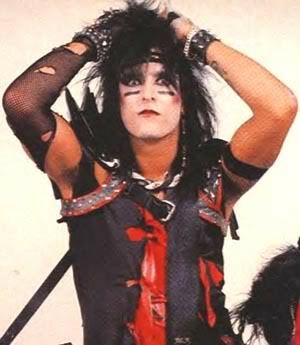 Finally, in 1981, Nikki Sixx was released to the public. He joined with the band Motley Crue in order to lure teenagers into believing that the way to rebel against the feeling of pointless futility created by life in a mindless consumer culture was, quite simply, to consume more. Sixx was instrumental in turning the angst of an entire generation into a sense of perceived longing for drugs, sportscars and airbrushed Playmates. However, time has taken its toll on the cybernetic being. Other, more fashionable machines like the robot known only as Jay Z and the Taylor Swift-o-matic 9000 (later shortened to Taylor Swift) have caught the attention of a new generation of alienated young people. Sixx served his country by helping to defeat any sense of community in the young, leaving them isolated and powerless against the great soul-sucking nightmare often referred to as The American Dream. The Pentagon will honor him by playing “Dr. Feelgood” and lowering all umlauts to half-staff on Friday. Plans are already in development for Nikki Sevenn, a new virtual “glambot” that will allow people to artificially perceive themselves as admired and loved by others while sitting in the stark loneliness of their basement or cubicle. Using the latest in artificial intelligence, the Sevenn Series will allow customers to virtually experience a “Just The Highlights” simulated rockstar experience. You will be in Nikki Seven’s head for the partying and the groupies but miss out on the harsh realities of venereal disease, hangovers and the crippling sense of meaninglessness that a life of rock and roll excess can yield. Nikki Sevenn will be available to download into your Home Sweet Home by next Christmas.